There It Is! 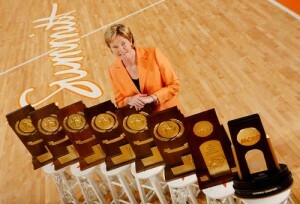 The Jake Stevens Show » Blog Archive » Thoughts and Prayers with Coach Summitt. After 1000 wins & 8 National Titles, Legendary Tennessee Vols coach Pat Summitt is now in for a real fight. This entry was posted in college basketball, Jake Stevens Six-Pack and tagged dementia, lady vols, ncaa, pat summitt, tennessee vols. Bookmark the permalink.